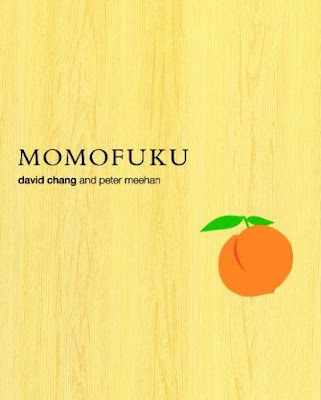 After falling in love at first read when I opened David Chang's Momofuku cookbook at the end of January, I was finally feeling healthy enough this weekend to dive in and try a recipe. I decided to ease into things with the simple Pork Belly Ssäm with Mustard Seed Sauce recipe. I should mention that in the weeks I spent eagerly waiting to play with what I suspect will quickly become one of my very favorite cookbooks, I stumbled across an awesome blog of somebody cooking her way through it. You can see her post about this recipe here, but I encourage you to check out the whole blog when you get a chance. Maybe someday my photos can look as pretty as hers... Sigh. Anyway, I ran into a problem that she noted over there, which is that the pork belly I picked up at H-Mart was cut into strips that were too narrow. before returning to the oven for another 30 minutes until golden and beautiful.. I'll confess to a strategic component in choosing the above angle for the picture, since I actually had a couple spots that were starting to burn at this point. I must say that I'm quite pleased to have 10 tablespoons of pork fat at my disposal, and not entirely shocked that so much rendered off... Woot! Despite the minor issue with overly-caramelized bits, the pork belly ended up absolutely gorgeous. From this point you need to chill the meat if you want perfect, lovely slices, so I wrapped it up and threw it in the fridge overnight. then simmered super-gently until most of that liquid is gone and they look all pretty. Seriously. Don't these look sort of awesome? The other component I needed to make for the sauce were some quick-pickled cucumbers. The slices are tossed with salt and sugar, then rinsed and patted dry after about 10 minutes, ready for use. The mustard seeds and chopped cucumbers are combined with mayo (preferably Kewpie), Chinese hot mustard, Dijon mustard, and thinly sliced scallions. The above ingredients are thrown in a blender until smooth, then combined with the shrimp to marinate for a few hours, after which the shrimp are threaded onto skewers for easy grilling. then served with fresh cilantro and mint, finely julienned cucumber, red chili, and a hot/sour/salty/sweet dipping sauce made with chilies, lime juice, fish sauce, palm sugar, and garlic. The ingredients can be wrapped in a lettuce leaf for dipping, or just combined haphazardly on a fork or between a pair of chopsticks. This was awesome. The chicken version is still a nice (more budget-friendly) dish, but the lime leaf marinade was absolutely perfect on shrimp. I will be making this many more times in the future. Not bad for a last-minute dish thrown together from ingredients on hand... But let's get back to the main event: the pork belly. The chilled pork belly is cut into ~1/2-inch thick slices. To make up for my overly-narrow pork belly, I sliced on an angle and got some nice pieces. These slices were thrown on the grill over high heat to char up and heat through. ... during which process the pork belly transformed into something brilliant. It still has me in its thrall somewhat, so I'm having trouble finding any words more eloquent than "Mmmmmm...."
The pork is served with that awesome mustard seed sauce I made earlier, as well as a bit of short-grain rice and some lettuce leaves for wrapping. This was fantastic. The pork belly was SO. EFFING. GOOD. The tang of the mustard sauce and freshness of the crisp, cold lettuce were perfect with the rich, decadent pork belly. I loved that this cooking method rendered so much of the fat, too. Let's not kid ourselves: this is a thoroughly unhealthy dish... but that 1/2-inch of pure fat that we've been seeing on top of our pork belly at Sommelier Smackdowns was almost fully rendered during roasting, leaving a much more practical meat-to-fat ratio in what is consumed, with the bonus of lots of yummy pork fat for use in future cooking. I just finished dinner about 10 minutes ago and, despite the fact that I couldn't finish and am so full that I feel like I'll never need to eat again, I sort of wish I was eating that pork belly again right now... I'm planning on checking out two more Momofuku recipes next weekend... Can't wait.